SS Cygni is a special kind of binary system, consisting of a red dwarf star and a white dwarf. According to theoretical models, the white dwarf strips gas from its companion, which leads to periodic outbursts of intense light: a recurrent nova. However, previous observations of the system placed it too far away for those models to work, casting doubt on the theory — a problem for types of systems other than recurrent novas. A new observation using radio telescopes found a much more amenable distance, but led to another problem: why were these two distance measurements so different? 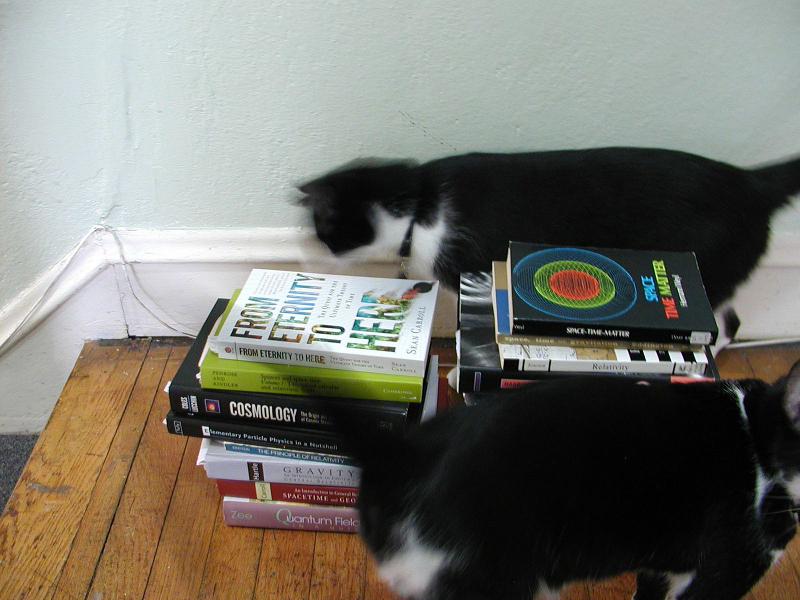 My cats, Pascal and Harriet, with a few of my books that deal with the topic of relativity. Albert Einstein is many people’s archetype of the genius scientist, and his most famous equation is E = mc2. Or is it? When you look at Einstein’s published scientific papers over decades of work, he didn’t (usually) write the equation in that form. In fact, he pointed out that was an inaccurate form, since it’s a limiting case of a far more general principle. In my latest piece for Double X Science, I argued that the form of the equation is far less important than its meaning, and it doesn’t really matter if Einstein wrote E = mc2 or not. Did Einstein ever write his most famous equation? Consider this question a 6-year-old might ask: Why doesn’t the stomach digest itself? After all, the human stomach contains hydrochloric acid, which is uses to break down some pretty tough substances for digestion. The answer, as Roach points out, is that it does: The acid dissolves the lining of the stomach over the course of a few days, but new cells replace the destroyed ones. When a person dies, no new cells are born, leaving the acid to work undeterred…with predictably gross results.